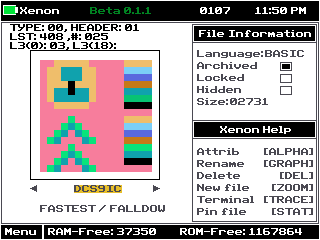 Xenon Has been completed !! Adding a few touches to GUI. It's Basically in it's Debugging stages. I hope to release this shell hopefully by the end of this year. when are you going to release it?! Just and john, he said "by the end of this year". It's December eleventh, I think you can wait at least the 20 days until the new year before poking for another release date. Good work alvajoy, I look forward to seeing the final product! Justin, there is one month left in 2018 hopefully before January. I love when users ask me this question it gives me hope and courage to finish the project. What are you doing so far? So far I am almost done with the last touches to the GUI, am working on the INPUT call I want to make sure users see where they are typing with a cursor. Are there going to any updates after Beta release? Yes, Look forward to releasing more versions. Xenon will be open source after first Beta release. "Running basic programs work just fine "
* 10% of programs run and crash right after "RAM LEAK"
"Menu Allows 6 pins "
*Running basic programs from menu Run GREAT ! * Pins does not display properly When Pins has been deleted.
" Everything works in the settings "
" Do you think a terminal is needed "
*is there to little settings? I didn't take time to read the thread all the way through, but as of now how is the progress going? So far Xenon Is done. It's now in stage 2 of production. which means adding new features and making the shell better. 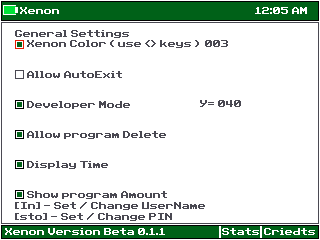 I will be adding a better UI for program selection and more. Although I enjoy the Cesium-like look, perhaps (later) you could try your hand at making a completely different looking GUI? Perhaps add some animations! I'm not sure what 'menu ICON display' means, does it mean that you can view multiple programs/ icons at once? If not, I'd like to request that feature! Well I tried your release, and it's a start I guess. There's an issue with displaying icons. My ADVSPEED program (written in BASIC) just showed up as a black square. BLASTCSS (written in C) was a garbled mess of colors. 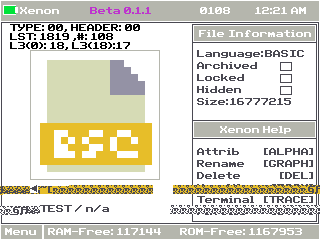 DCS9IC (written in BASIC) seemed to have the wrong palette. 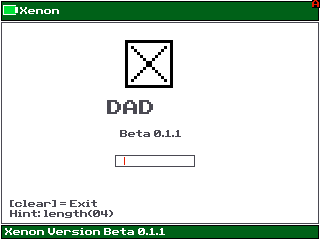 Strangely, some programs, like Chess, displayed their icons just fine though. When I tried to run my ADVSPEED program, on my physical calc I got a memory error (I had 150K RAM before running it, after I had only 87K of RAM left. Which should still be plenty to run such a small program) On CEmu it just crashed. Pinning is really weird. 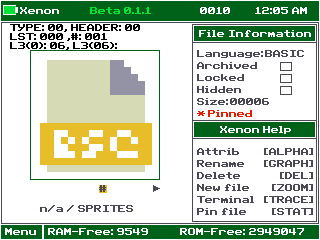 The first program is shown as *Pinned but doesn't show up in the pins list. When I pinned a different program, it showed up twice. 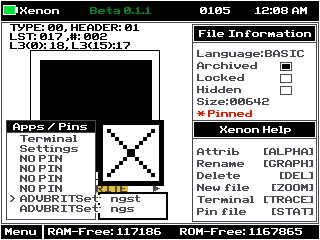 When I tried to run a NO PIN, it froze for a few seconds but seemed to catch itself and just quit Xenon. Sorting and renaming a program is also weird. 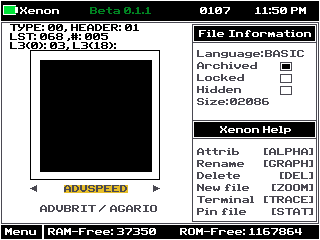 I renamed the file 'AGARIO' to 'AGRIO' and Xenon sorted it to the very back of the programs list (with the Z's) even though it has an A as its first character. My HDPIC program was also sorted to the very back even though I didn't rename it. I created a new file 'TEST', it got sorted to the back so I scrolled all the way over there. I accidentally went too far and I got into some corrupted name territory. The attributes menu stopped working for me. If I press [alpha] it just wont go into the attributes settings. In the credits, PT_'s description should be -> Making the ICE compiler! Helping me with saving. That's all I found for now. Happy bugfixing! Thank you TLM for the bug report . I fixing them now. Also, It seems that you are having trouble with the run command. This is the correct syntax 'RUN <A/B> PrgmName'. A/B meaning basic or Asm. 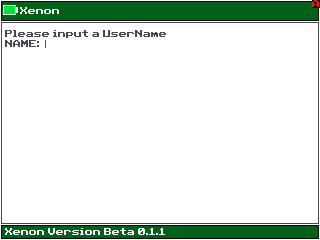 Example "RUN B TEST" this will tell the shell that I am trying to run a basic program. I have finished fixing some of the bugs TLM has reported. right now I am trying to add VAT organizing. Do you want to help out with Xenon [C]? Nobody is going to write your program for you. 1. There seems to be this weird area where text gets corrupted. 2. Like TheLastMillenial's problem, palettes and pictures seem to have a problem. I did not ask Cemetech users to write the whole program for ME!!! I am moving to C and was asking if anyone wanted to help me out with the programming or add features to it. it basically a C open source version. I am looking into the icon displaying. I am trying my best to fix most bug right now. that clear Xenon data. I will have to ask LAX18 about the running program issue. So basically, if they would write the program for you? It's your project, you are going to have to write the code. If you need help with a specific feature or are facing implementation issues, that is "help". Asking for others to add "features" to your project for you is beyond that. [4:07 PM] <saxjax> [Alvajoy123] iPhoenix if you don't have nothing good to say don't say it!! [4:08 PM] <saxjax> [Alvajoy123] Am just saying.. I fully think that everything I have said has been "good", in that it is intended to help you. There are 299 users online: 16 members and 283 guests. Members: Alex, calclover2514, Jeffitus, KarolHo, kg583, LogicalJoe, readroof2, realdonutking123, RogerWilco, Spenceboy98, TimmyTurner62, UDXS. © Copyright 2000-2019 Cemetech & Christopher Mitchell :: Page Execution Time: 0.180660 seconds.